Anyway, it was a telly show that previewed clever, expensive items that we were likely to see in the years to come. 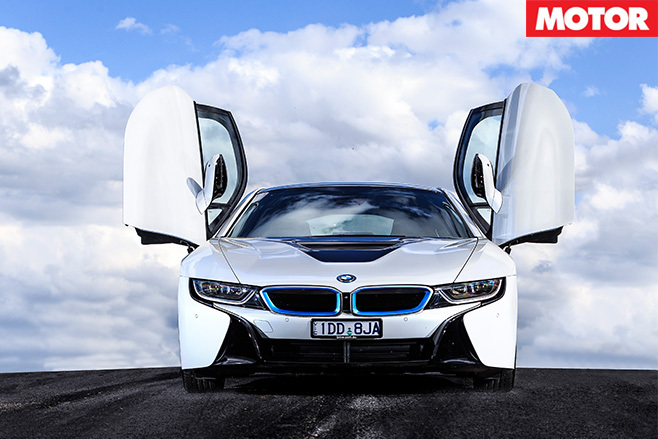 The BMW i8 – for me at least – falls squarely in this category. 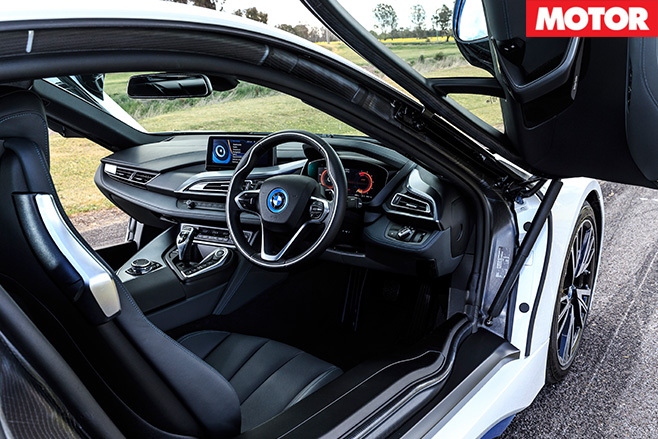 Everything from its carbonfibre-reinforced plastic passenger cell on an alloy chassis, its modular construction, its unusual body styling and tricky swing doors, its small-but-well-formed pair of power sources – even its iPod-white and electric-blue colour scheme screams ‘science project’. It’s a very advanced science project, of course, and it’s the only hybrid on test here at PCOTY this week; a stat that’s sure to unwind in future events. When the raw numbers are brought into it, though, what we have is a 1400kg-plus AWD 2+2 coupe with 266kW and 570Nm. In this company, the numbers aren’t knockout strong, and are somewhat limited by the size of the petrol engine – a 1.5-litre inline three-potter pinched from a MINI with a ginormous turbo whanged on it – and the electric motor that runs the front end. Its relative lack of pace compared to the pointy end is immediately exposed at DECA, as is a lack of mechanical grip and steering feel. Its stability and traction control intervention, too, is very overt, killing the fun even in Sport mode. Underneath all that, though, is a stiff, light chassis that’s just begging to be let off the electronic leash, something that is borne out across the Alps time and again. The electronically enhanced soundtrack is sufficiently well done as not to be a distraction, a (somewhat surprising) lack of gizmos keeps the experience pure, and being able to settle back an d select electric mode (albeit for well less than the prescribed 37km) gives the i8 a second life. It’s all brought undone at the track again, though, as it just feels slow and safe and not very ‘feelsome’. It sounds great and is easy to drive, but there’s no edge or vibrancy. It comes back around to that idea of it being a science project. 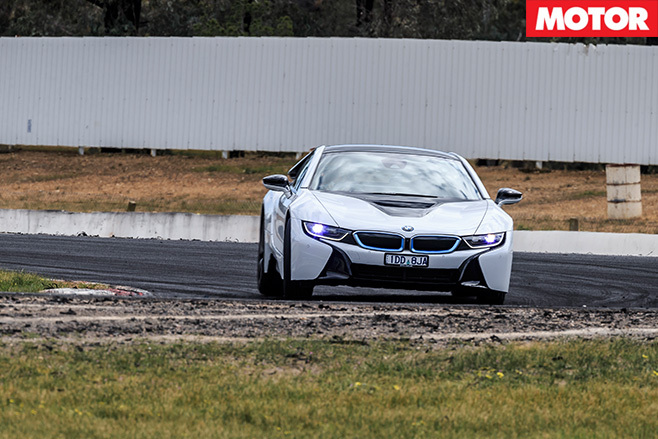 Look at the price of other performance-orientated hybrids out there – McLaren P1, Porsche 918 – and the i8 is a relative bargain. Consider, too, that this is the first generation of the car, and BMW has gotten a lot of things very right. 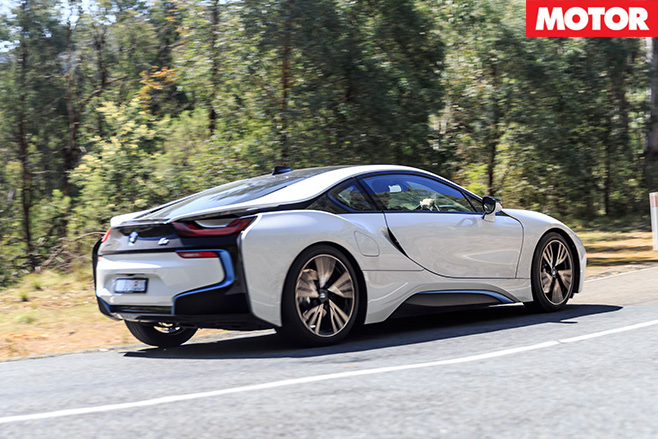 The i8 was found wanting in this year’s PCOTY, but don’t be surprised if another, much more focused version makes a start in a couple of years’ time.